One of the best outdoor games for large groups during my childhood was a trampoline battle royal. This entailed inviting all our friends over to see who could be the last kid standing at the end. Was it safe throwing buddies off a trampoline or suplexing them into oblivion? Doubtful. But it was fun! As a more cautious parent than mine in the 1980s, you want saner games for your precious children. I guess my parents figured they’d just have another son if I met my demise in between rusty trampoline springs. 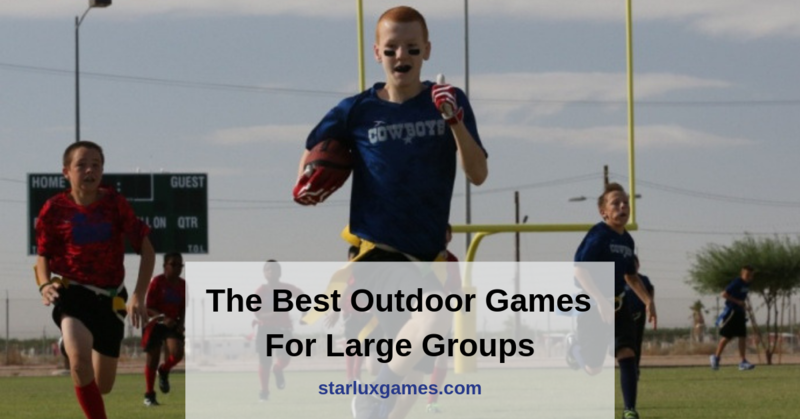 To help you find the best outdoor games for large groups, I have gathered some that are great for kids about 12 years old on up to adults. And just because these games are not dangerous, does not mean they are not insanely fun. First up let’s look at football. It’s that time of year and there is more to life than playing fantasy football. Dads, I’m talking to you. You can still manage your fantasy team at halftime of a healthy game of flag football with your kids and all their friends. If it’s hard to find enough people to play, then join an official league or create one at your church. Capture the Flag Redux is on the same level as football in my eyes. Both outdoor games are about defending a territory. The best part about CTFR is you can play it after dark. It’s hard to play flag football in the dark unless you have access to stadium lights or you want to ram into each other in the darkness. That’s a sure way to get a concussion. 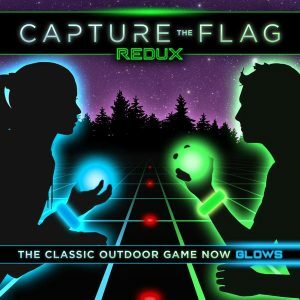 If you enjoy fun glow in the dark games, you will LOVE Capture the Flag REDUX. I will have to include soccer since some countries think that is “real football.” All soccer insults aside, it is an awesome outdoor game for large groups. It can be played anywhere an open field is available. It’s a game that enhances picnics, family reunions, and BBQs. Not to mention the fitness it creates in the players. If soccer isn’t your thing then you might want to introduce your group to FootGolf. I can’t make this stuff up. This combination of soccer and golf even has an official governing body. The pace will be slower than soccer and you don’t need expensive golf clubs. Hard to argue against what some may call an idiotic sport. I thought I was dreaming last weekend when I saw dodgeball being played on ESPN 2. But it really happened. Some program director thought it was a good idea to put this playground activity on national TV… and I’m glad they did! Sure, the camera work was terrible at times and I knew not one player. But the game was pure pleasure and brought me back to my glory days of 7th grade, dominating our version called Prison Ball. Dodgeball will go down in history as one of the best outdoor games for large groups no matter how popular Fortnite becomes. Can it get any simpler than dodgeball? Yes. Foot races are perfect for getting large groups off the web for a day of human interaction and working up a sweat. I guarantee more friends are made during 5Ks and half-marathons than on Facebook. When was the last time you hung out with more than one person on your FB feed? But folks who run together end up training with one another and having lunches. Some even get married! So far I have listed outdoor games that can burn serious calories. Now for an activity that won’t necessarily carve out a six-pack. Fishing tournaments can increase fitness if they involve paddling a kayak or canoe. And walking around a lake is good exercise even if the group mostly catches nothing. The main benefit of fishing is the outdoor effect on us. There is little doubt that placing ourselves in nature makes us feel better. That means spending time on a lake or walking up and down a stream is a perfect way to bounce back from a rough week at school or work. Fishing tournaments can be found everywhere and they are a great way to meet new people, young and old. Tournaments can even be set up with your local church or a recreation department. 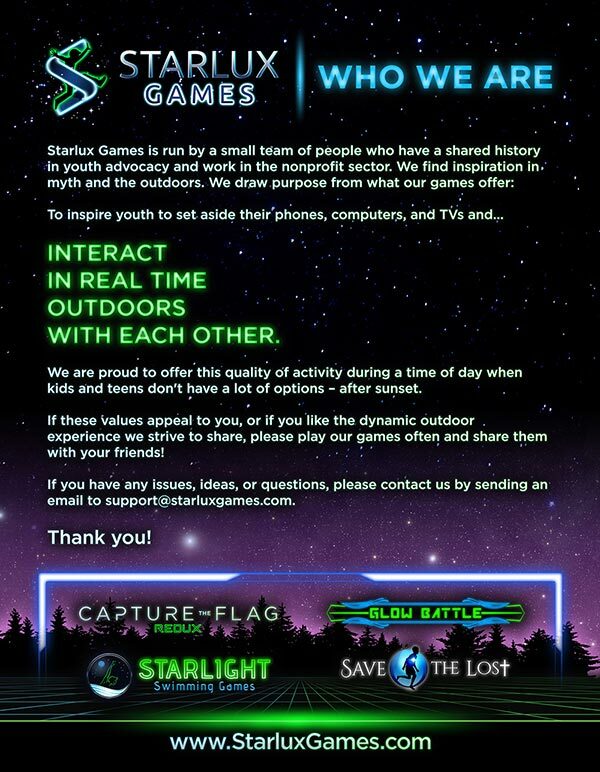 To wrap up our list of the best outdoor games for large groups please make sure to check out these wacky games. They cannot be as fun as the trampoline battle royals that left me with a couple scars. But they are creative, and even with the weird factor they get people off their butts and off their gadgets. So play on! The featured image of youth playing flag football that is used for this blog post is by U.S. Marine Corps Sgt. Travis Gershaneck and can be viewed here.